Got addicted with Flappy Bird game? Want some more, a better one? We have a beautiful & lovely one for you here! ● Tap to fly, do not fall down. 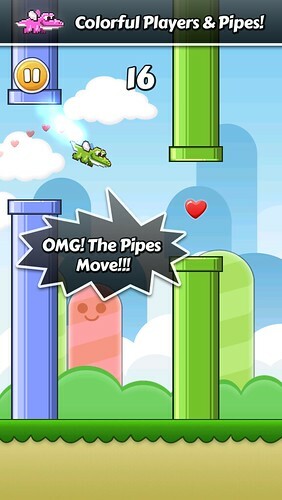 ● Avoid pipes & other obstacles. ● Get 4 medals to unlock very cool stuff. ● Get every 5 points for a wisdom of happiness reward. ● Two players with different weights. ● Beautiful game effects & awesome graphics. ● Bronze Medal: 10 -> 19 points (unlocks clouds background). ● Silver Medal: 20 -> 39 points (unlocks landscape background). ● Gold Medal: 40 -> 59 points (unlocks new player). ● Ruby Medal: 60 points and above (unlocks weight loss for the new player). All game tips are found in the assistant banner at the top of the game over screen. You can swipe up/down to hide/show the assistant banner. Please feel free to contact us if you need support or have any requests.